This week, Washington, D.C. Mayor Muriel Bowser unveiled the details of her plan to raise the minimum wage in the District of Columbia to $15 an hour by 2020—unfortunately, the main difference between the Mayor’s plan and the ballot initiative is that her plan perpetuates the unjust subminimum wage for tipped workers. Currently, tipped workers in the District are paid a minimum wage of just $2.77 an hour before tips and depend on diners to pay the bulk of their wages. Mayor Bowser’s proposal would raise the tipped minimum wage to $7.50 by 2024, where it would equal half the regular minimum wage. Having this separate, lower minimum wage for tipped works is unique to the United States; no other country has a separate minimum wage for tipped workers. This two-tiered system—which Mayor Bowser’s law will perpetuate—enshrines both gender and racial inequality directly into our labor law. The result is lower wages and higher levels of poverty for tipped workers, who are more often women and people of color. When the first minimum wage was created in 1938 as part of the New Deal, it exempted many of the industries that commonly practiced tipping. The explicit subminimum wage for tipped workers was established in 1966 when the Fair Labor Standards Act was expanded, and restaurant owners and their lobbyists have defended the two-tier system ever since. The result is a subminimum wage for tipped workers that has been stuck at $2.13 at the federal level since 1991 and at $2.77 in DC since 1993. This system has an obvious implication for working people who make their living in restaurants: they have lower wages and are much more likely to live in poverty. In states where tipped workers are paid a base wage of just $2.13 an hour, they are more than twice as likely to live in poverty than other workers. 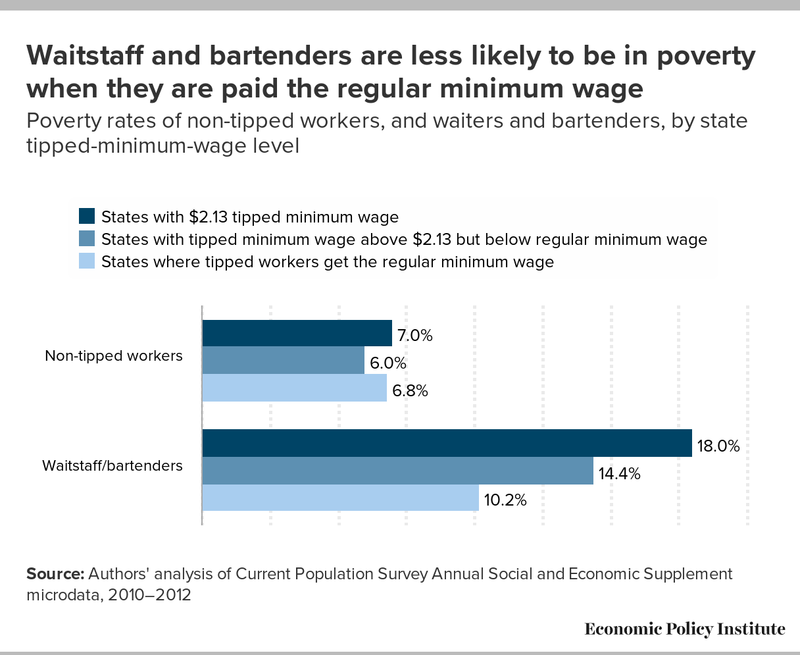 In these states, 18 percent of waitstaff and bartenders live in poverty, compared with 7 percent for other workers. In places like D.C., where tipped workers are paid a base wage somewhere between $2.13 and the full minimum wage, 14.4 percent of waitstaff and bartenders are in poverty. In the eight states that require restaurants to pay the regular minimum wage regardless of tips, the poverty rate of waitstaff and bartenders is significantly lower. Only 10.2 percent of these workers are in poverty—eight percentage points lower than in the $2.13 states. In response to Mayor Bowser’s plan, the Restaurant Association of Metropolitan Washington argues that even the modest increase to $7.50 will hurt restaurant workers by depriving them of lucrative tips. This argument, which rears its head every time an increase to the tipped minimum wage is considered, has no basis in fact. In the states where all workers make the regular minimum wage, waitstaff and bartenders earn 20 percent more (including tips and base wages) than waitstaff and bartenders in the $2.13 states. Defenders of the two-tiered system are quick to point out that restaurant workers are in fact legally entitled to the full minimum wage when they add their tips to their base wage, but the onus is on employees to keep track. Data from the U.S. Department of Labor (DOL) shows that violations of this system are rampant. Of the 9,000 investigations of full-service restaurants that the DOL completed between 2010 and 2012, 84 percent were found to have a violation. Tipped workers legal right to the full minimum wage is up against a system that is hard to enforce and rife with wage theft. Our system of tipping also perpetuates race and gender inequality. Tipped workers are predominantly women (66.6 percent), and women in tipped occupations make even less than their male counterparts. These women are also forced to endure endemic sexual harassment because their paychecks rely on the satisfaction of their customers. According to a survey conducted by the Restaurant Opportunities Center, 59% of women in the restaurant industry report receiving unwanted sexual attention from patrons at least once a month. Racial and ethnic minorities are also over-represented in the ranks of tipped workers, where they are subject to lower overall wages and the discriminatory tipping practices of patrons. African-American female servers make just 60 percent of what male servers do. The simplest way to end this exploitative system is to eliminate the subminimum wage altogether. The states that have done this (Alaska, California, Hawaii, Minnesota, Montana, Nevada, Oregon, and Washington) actually have higher restaurant sales per capita, and have experienced faster industry growth. It will certainly be an adjustment as restaurant owners move to paying their staff directly, and that’s why proposals to eliminate the tipped wage call for the change to be phased-in slowly. Dynamic restaurant industries in places like California, which is on the path to $15 for all workers, prove that it can and should be done. The D.C. ballot initiative plan to raise the tipped minimum wage to meet the full minimum wage at $15 by 2024 is a reasonable and necessary approach to ending the unjust two-tier system. Mayor Bowser’s proposal of a $7.50 tipped minimum wage, while better than the current $2.77, continues to enshrine decades-old oppression into our law.